I read your blog on liver and kidney and was surprised to read “avoid essential oils” because they can impair liver function? Are you mistakenly meaning Frangrance oils vs plant essential oils? I found this very odd as it very much contradicts publish research and well and naturopathic studies. Compounds in essential oils, certain ones and within reason can be very beneficial. Just wanted to ask why you might suggest otherwise? Yes, this is quite shocking for many people to hear. Based on research that is being done essential oils destroy mitochondria in the body. Essential oils are more effective at killing bacteria in the body than antibiotics. Yes, just as drugs impair liver and kidney function essential oils do to. Essential oils are extremely concentrated and are made by extracting and concentrating the volatile oils from the plant. Why do you feel you need to use them? One drop of peppermint essential oil is equal to the amount of volatile oils you would get from 25-30 cups of peppermint tea. Does this seem safe to you? Then there is the way the plants are treated when they do harvesting for essential oils and how much plant material is used. If you would like to speak to directly to Susun about this, please call Blog Talk Radio any Tuesday evening from 7:30-9:00 pm EST. 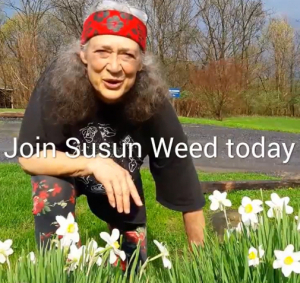 1-646-929-2463 Make sure to press one to speak with Susun. A caller on blogtalkradio talks about the various herbs, infusions and tinctures she's been taking and says that she is now having sleeping problems. She stopped all herbs but the sleeping problems haven't stopped and she asks Susun if something she was taking could have caused a hormonal change. Susun starts by saying you should always use herbs one at a time and gives the caller other suggestions. This audio is just over 4:00 minutes long. Drinking comfrey infusion has benefitted me in many ways: It keeps my bones strong and flexible. (An old country name for comfrey is "knit bone.") It strengthens my digestion and elimination. It keeps my lungs and respiratory tract healthy. It keeps my face wrinkle-free and my skin and scalp supple. And, please don't forget, comfrey contains special proteins needed for the formation of short-term memory cells. Comfrey leaves are not only rich in proteins, th...ey are a great source of folic acid, many vitamins, and every mineral and trace mineral we need for a strong immune system, a calm nervous system, and a happy hormone system. See why I'm so fond of comfrey? What a marvelous ally she is! Not dangerous at all. When I identify with comfrey, I feel powerful and proud, beautiful and exuberant. When I identify with comfrey, I feel the flexibly that comes from being knit together. When I identify with comfrey, I feel very green. How I do it: Two or three times a week, I drink a nourishing herbal infusion made by steeping one ounce (by weight!) of dried comfrey (uplandica) leaves and flowering stalks in four cups boiling water in a tightly-lidded quart canning jar for 4-8 hours. Slippery elm is wonderful herbal ally. I make lozenges by mixing slippery elm bark powder with a little honey. I stir until it clumps up, adding more honey if needed. It's just right when it's like pie dough. Using my hands, I make balls the size of hazelnut or bigger, and roll them in more powdered slippery elm so they don’t stick to each other. I store them in a small metal tin; and don't leave home without it. Slippery elm is so safe that you can dissolve a ball in your mouth as often as you want, any time you feel any distress. If you’re working with an ongoing condition, at least two a day is good. Slippery elm restores the lining of the intestines, prevents any agents within the body from disturbing the intestines, and neutralizes any poisons that are present in or around the intestines. Cold and flu season is approaching. Here's some Elder remedies to help keep you healthy. Fill any size jar no more than half full of dried elder berries. Fill jar to the top with 100 proof vodka. Cap, label, wait for six weeks, and use. Put 1-2 ounces of dried berries in a quart jar and fill to the top with boiling water. Steep overnight. Drink it, a half cup at a time, or turn it into a decoction. Pour a quart of infusion, berries and all, into a saucepan and gently simmer until the liquid is reduced by one-half or more. In other words, you want to wind up with 1-2 cups of decoction. The decoction may be taken by the teaspoonful. It keeps best if refrigerated. Or make a syrup with your decoction. When you have reduced it as much as you wish, add sweetener. A classic syrup contains as much sweetener as herbal liquid. So you could add a cup of honey or maple syrup or white sugar to one cup of elder berry decoction. Syrups need to be refrigerated. Buy glycerin at the drugstore or health food store. Dilute it by at least half with sterile water. Dilutions as low as one part glycerin to four parts water will work. Fill a jar no more than half full of dried elder berries. Fill the jar to the top with the diluted glycerin. The resulting glycerite is ready to use, by the dropperful, in 6 weeks.